Recorded and mixed by Will Lofton at Shangri-La recording in Atlanta, GA.
"That's just economics, just a game / Competition makes everything the same / The present is like the future." That's what you might feel when switching the channels to find nothing but commercials, as Andy Ditzler writes in "Economics." 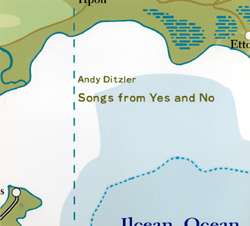 Ditzler delivers a stirring creation of current events and everyday life issues, embellishing all his ideas into a masterwork of classic pop music. Songs from Yes and No has the listener embarking on a journey into the mind of discernment. Ditzler's voice is penetrating and full of passion, his message clearly heard. His songs spill over with topics Ditzler has deemed critical to today's world. "Just the Six of Us" is a myriad collection of pop culture's hit songs of the '70s and '80s in six condensed minutes. Breathtaking in musical scope, Ditzler paints an atmospheric portrait full of color and texture, slipping in well-known song lyrics such as "Just the two of Us," "You probably think this song is about you" and "Don't let the sun catch you crying." Luscious saxophones breathe dazzling life into "To Know You Better," complete with charming piano, creating a pristine, jazz-like setting. After four minutes of candid structure, the music falls to pieces into ultimate chaos, as the music dissolves. "Citizens" delivers a message of how real, everyday Americans can feel scared of being in their own country. "If you're confused, then you're doing great. It's okay if you don't understand," she shouts in a frightening story about struggling through a normal workday. Ditzler's music is drenched with the essence of the trials and tribulations of normal, humdrum everyday American life. The subject matter ranges from technology to shopping, television to metaphysics, each issue bubbling over with intensity. The music is witty, intelligent and intriguing. His entrancing melodies and clear-cut vocal delivery are appealing, enlightening and full of discovery with each active listen. A healthy dose of this music will give you a new perspective of the world.